HURFOM: On the heels of the 2010 general elections, farmers in Kyaikmayaw Township, Mon State, successfully reclaimed some of their former lands, all of which is located between Bar Bu Gone village and Kha Yone Gu hill, though on the land yet to be returned, the Mon State government has implemented a coconut farming project, a move that has been heavily criticized by those still waiting to have their lands released. The farmland, estimated to total approximately 1,500 acres, was seized by the State Law and Order Restoration Council (SLORC) shortly after the 1988 military coup that brought the SLORC to power. 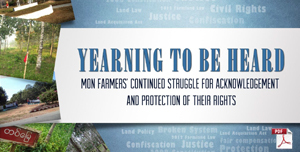 Under the SLORC, farmers paying an extortionary tax were permitted to continue farming the land, though by 1994 farmers had stopped working the land in response to ongoing arbitrary taxation, and unfavorable growing conditions. Rather than return the remaining 1,000 acres of land, in full, to its rightful owners, between 2017 and 2018, the Mon State government used the land to implement a coconut farming project, according to Nai M—, a villager from Kaw Naut village track, Kyaikmayaw Township, who lost his 40-acre plot to the project. 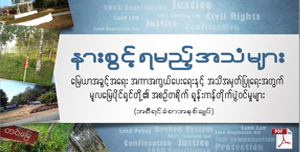 After the 2010 general elections, local farmers appealed to the Mon State Parliament in a bid to reclaim their lands, and the Mon State government proceeded to return 500 acres to farmers, while retaining control over the remaining 1,000 acres. 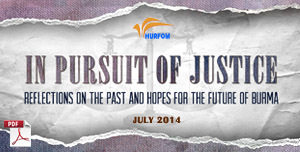 “[The government] said they’ll give the land back, but they never handed over the land to us. When making inquiries about the land, some government departments replied that the military and the government department didn’t need the land anymore. Even though they didn’t need the land, they didn’t give back the land to us. Now, the coconut farming project has been implemented under the instruction of the Mon State government,” said Nai M—. 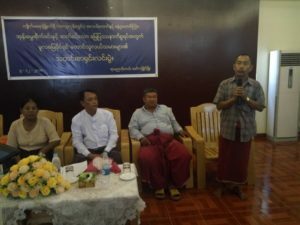 On December 5th 2018, some 50 local farmers organized a press conference at the Rehmonnya Hotel in Mawlamyine to voice their grievances over the coconut farming project and the continued seizure of their lands. On January 10th 2019, Mon State Chief Minister Dr. Aye Zan, and U Tun Htay, Mon State’s Minister of Agriculture, Livestock, Transportation and Communication, visited the area to determine whether conditions would allow for the implementation of a sugar cane growing project, and a second coconut growing project, in the coming raining season. “The farmland is ours, but I wasn’t invited to farm green coconut. The minister just discussed [the project] with only four farmers [from Kaw Naut village] who hold Form No. 7 (Land Use Certificate)…But all of the farmland isn’t just located in Kaw Naut. There is also farmland from Kaw Tat and Kaw Swel. 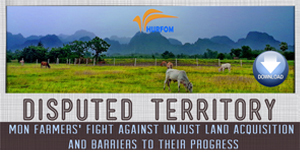 All the farmland in all three villages has been confiscated,” said Mi H—, a Kaw Tat resident who lost her 60-acre plot. 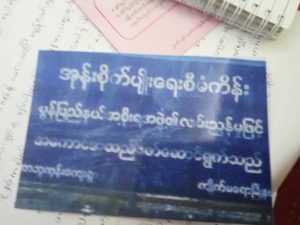 During President U Win Myint’s visit to Mon State in December 2018, 29 local farmers filed a report to the President. “Our demand is that the farmland confiscated by the military, the armed groups, and the government departments under the name of [development] projects, be returned to the original owners. We want the farmland…We don’t want any substitute. [The government] must grant Form No. 7 to those farmers who don’t have the documents yet. We’ve also demanded a stop the ongoing coconut farming project,” said Mi H—. 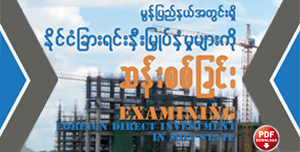 On November 28th 2018, the Mon State Chief Minister Dr. Aye Zan claimed that the farmland included in the coconut growing project area belongs to the Township General Administration Department (GAD), and that the Mon State government has leased the farmland at 20,000 kyat (US $13.07) per acre from the GAD. More than 30 years after their land was seized by Burma’s former military junta, and despite government guarantees in the months following the 2010 general elections, farmers in Kyaikmayaw Township have yet to have their lands returned to them. 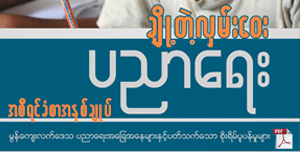 As for the Mon State government, who have limited autonomy over the agriculture industry, which is managed at the Union level, it is all too easy to deflect any responsibility for these matters through mention of the GAD. 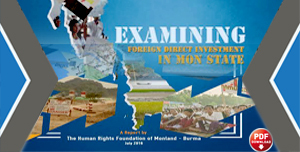 Added to this, and as past research conducted by HURFOM has shown, inaction on the part of land investigation committees established to resolve such cases, alongside an acute lack of transparency within government, provides no clear structure denoting to which authorities or government bodies victims should appeal regarding their land disputes, leaving farmers in Kyaikmayaw, and elsewhere, with little recourse to justice.